Many people in the IT community have been waiting for this. Even some LogMeIn competitors didn’t believe they would do it again, yet they did. 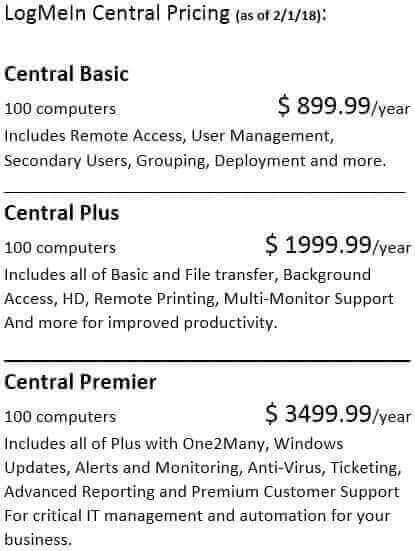 Yet again in January of 2017 they raised LogMeIn Central prices. This makes RemoteToPC an even more attractive LogMeIn alternative in 2017, as our pricing is considerably less than those for LogMeIn Central, or Pro. We thought LogMeIn pricing was too high back in 2015-16. This new level in 2017 is may help drive up their stock value for their shareholders, and help pay off their $1.8B acquisition of GoToMyPC from Citrix. It seems clear however that small computer consulting companies, and MSPs are the ones taking the hit for all that. With their purchase of GoToMyPC, they will be grossing over $1B per year, making them the 800 pound gorilla in the room compared to all of the other remote access solutions out there. RemoteToPC pricing is extremely competitive even when compared to the LogMeIn Central Basic plan, however some of the RemoteToPC features are only found in the even more expensive LogMeIn central Plus and Premier plan. For example the ability to copy files is only available starting in their Plus plan. Features like Monitoring and Alerts are found in their Premier plan. People who have a LogMeIn-Pro subscription for small numbers of computers will find the pricing of our smallest plan at $99 will cover them for up to 10 remote systems for a year. While LogMeIn stock is near an all-time high, it is unclear where they intend that these increases in price will stop. 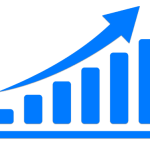 The addition of the GoToMyPC remote access customer base is sure to keep the annual gross earnings over 1 billion, and they may have factored in the loss of some LMI customers, who move on to LogMeIn alternatives due to this increase. They could potentially show a huge gain for shareholders this year even with the loss of 20-25% of their LMI business. While it might not make much sense from the standpoint of keeping their remote access customer base happy, it makes sense that their shareholders would be extremely happy in that situation. From their annual revenue growth in profits since they started raising prices back in January of 2014, raising the LogMeIn price has been nothing but rewarding to them. As long as they are continually rewarded for it, it is likely that they will continue to do so. It seems however that at some point they will reach the tipping point where those who buy a LogMeIn-Pro, or LogMeIn Central subscription will simply say “no more”. Many have already done so, and we expect more to do so as time goes on. RemoteToPC plans on being here to provide a more affordable alternative with an ever increasing feature set.